The University of Bristol's Sport Ground. A History of the Land. The University of Bristol's Sports Ground off Coombe Lane was formed from land originally occupied by Red House Farm. The land's history is recorded in the Sports' Ground Deeds and the occupiers of the Red House itself recorded in the various Census records from 1841(see Appendix). The Street Directories show that the Farm was owned by Edmund T Wedmore of 6, Bellevue Villas in 1880 and by FH Wedmore in 1891. The University has the "Abstract of the Title" of the above FH (Frank Hamilton) Wedmore, to "a certain farm house, lands, tenements and heridtaments known as Red House Farm.......in the County of Gloucester." This Abstract tells the story of the land. In his will of 28th October 1874, one John Stephens details the property which, on his death on 8th September 1876, passed to a William Gribble of 12 Abchurch Lane, London. On 1st October 1877 he sold the farm house plus 55 acres and 10 perches of land to Thomas Wedmore and Edmund Tolson Wedmore, who paid £3706/4s/0d and £2470/16s/0d respectively. Attached to the Abstract is an Indenture detailing all fields, names and acres, corresponding in many instances to the details seen on an 1840 Tithe map. Replica of the 1841 tithe Map with added relevant field numbers. Click on image for original coloured version. 1882 OS map (from microfiche). The field numbers on the OS maps are not the same as those on the Tithe map classification. On 16th June 1890 Edmund Tolson Wedmore sold his share of land to Thomas Wedmore for £2460.00, a loss of £10.80 after 13 years. On 5th February 1897 Thomas Wedmore died. The farm and lands went to Frank Hamilton Wedmore, who eventually inherited on 13th February 1899. The Map in the 1898 "Abstracts of the Title" document. Tithe map numbers. On 27th March 1899 part of the property was sold to Edward Payson Wills. Over the next few years other parts were sold or leased to other persons, including other members of the Wills family. 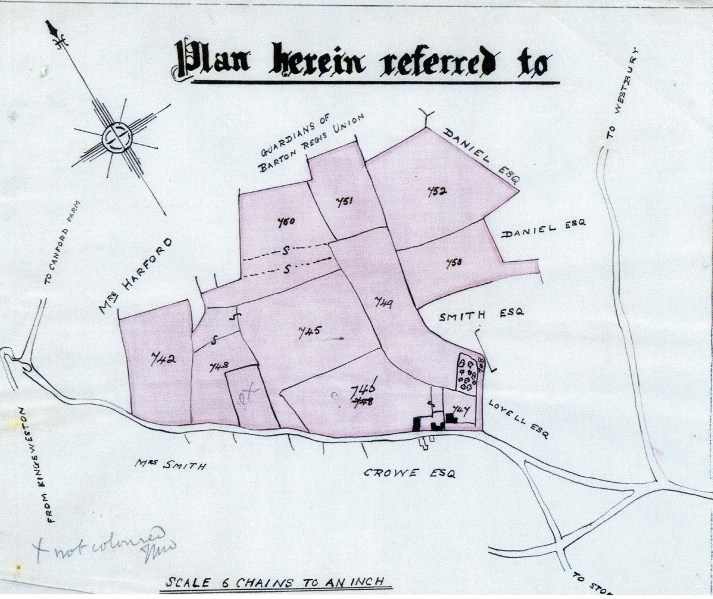 On 9th March 1911 the main fields of Red House farm were sold by FH Wedmore to the University. On 20th October 1911 the north part of plot 752 (OS number 260) was mortgaged by the Wills family to FH Wedmore. On 24th June 1922 two parcels of land, being Numbers 769 (OS number 259) and part of 770 (OS number 278) were sold by FH Wedmore to the University of Bristol for £2397.00. 1931 OS map: note lack of field numbers. New numbers to be allocated. Note. No Stoke Grove and no Conniston Ave.
On 16th February 1932 the rest of the field to the right of the present main entrance (1898 number 749: 1901 OS number 278: 1922 number 770 and number 1209 on the 1936 and 1949 OS maps and marked with a "W" above) was sold to the University by FH Wedmore. Around about that time the field was used as sports field by the General Accident, Fire & Life Assurance Co. A pavilion was built some time before 1936, but GAFLAC gave up the lease of the field in November 1946 and it became part of the general University complex. 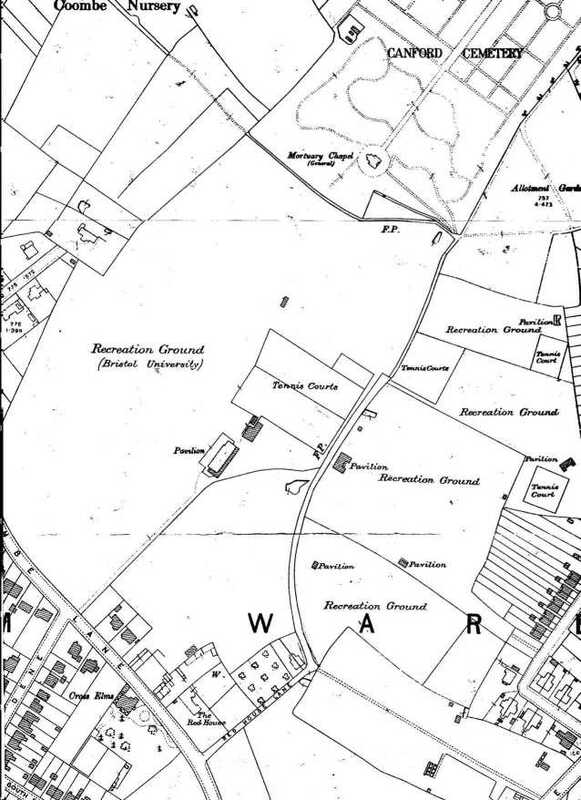 Incidentally, the 1931 map shows that part of this field, to the right of the present main entrance and fronting Coombe Lane, had been sold earlier for house construction. 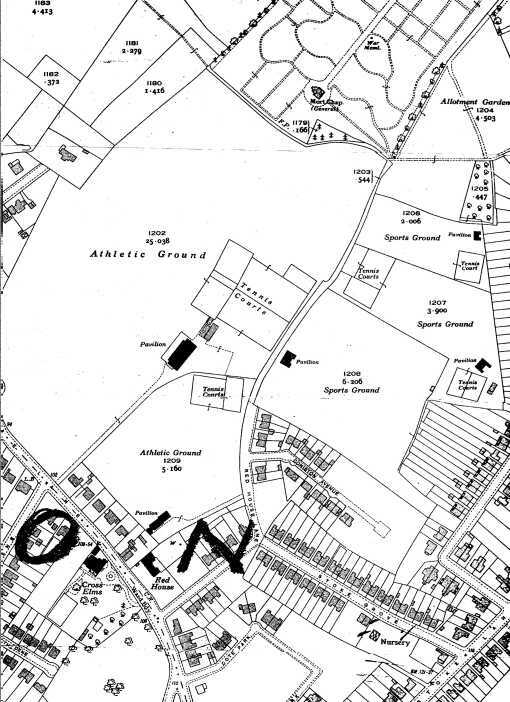 NB At some stage the field marked with "A" above (tithe field 753:1901 OS 280) was sold by its owner (Smith Esq in 1898) for the houses in Coniston Ave.
1936 OS map: Note new OS field numbers. Stoke Grove now laid out and part of Conniston Ave. built. On 26th May 1936 the chestnut trees lining the left of the drive to the main pavilion were delivered. They were picked up from Flax Bourton railway station by Bert Atwell, one of the groundsmen, in a horse drawn cart and transported to Bristol in a snow storm! Why they were collected from Flax Bourton is lost in the mist of time. Bert looked after the fields for 41 years, from the mid 1930s to the 70s. 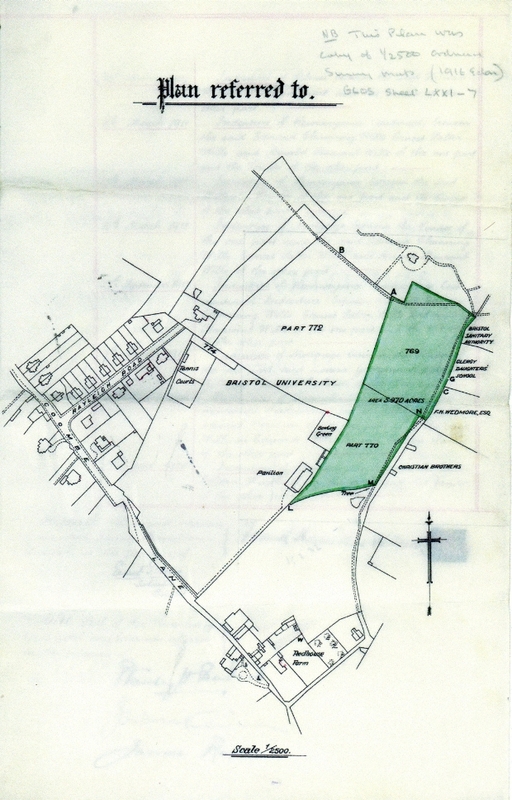 On the 24th July 1944 the University sold a small parcel of land, 0.166 of an acre, to the Corporation of Bristol. This was part of field 769, near "A", on the 1922 map, and near the top of this 1936 map. It was incorporated into Canford cemetery. The houses fronting Coombe Lane were complete by 1936. 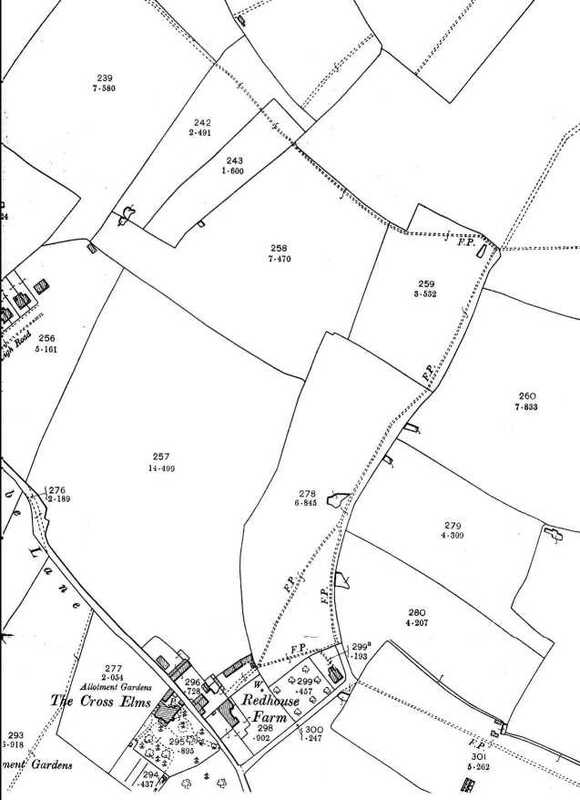 In 1953 most of the plots 752 and 758 of the 1898 conveyance (1949 OS numbers 1206,1207 & 1208), the ones to the right of the Public Right of Way and owned in 1922 by Bristol Sanitary Authority, Clergy Daughters' School, FW Wedmore and Christian Brothers, were sold to the University. Prior to that, part of 758/1208 had been a sports field for St Brendan's school. The other, upper, part (1207) was owned by the Stokes Croft Educational Foundation. The Foundation closed in 1979 and the University leased the land. This lease was due for renewal in 1999. St Brendan's moved to Failand and had no further use for the facility. This is why there are two pavilions on the present fields; a third, the GAFLAC one, situated on field 1209, was demolished in 1998. It is worth noting that, although the field numbers changed over time, their boundaries remained almost unchanged from the 1840 Tithe map. Interestingly, the main pavilion was burnt down by suffragettes and had to be replaced. "Q" Company of the 11th Gloucestershire Home Guard battalion used what they called "the St Brendan's pavilion" as their HQ during the War. In spite of this name, the actual pavilion was the main one, and for many years there was a plaque in the building commemorating the Home Guard connection. They paid rent for its use and also paid their share of the gas, electricity and water bills. In the University Archive, reference DM 1832, is a bill for £283/9/2 (£283.46) for these expenses from 1940 to July 1944. After the War the University received £333.00 as recompense for "dilapidations" resulting from war time use. Field 1206 was a sports facility for the Clergy Daughters' School. It, and field 1207, also had pavilions - not properly included in the above maps, but just detectable on the 1936 version. The 1207 Stokes Croft pavilion was used by the Stokes Croft old boys rugby club. Local legend says that they apparently didn't pay their rent regularly, sold alcohol on the premises without a licence - the brewery delivery truck drove up the nearby Public Right of Way in order to gain entry - and were somewhat unruly. Eventually they were forced to leave and the pavilion was demolished. During demolition it was found that the electricity and water supplies were derived from a nearby house! The pavilion on field 1206 was also demolished at some stage, but there are no local stories about this one. 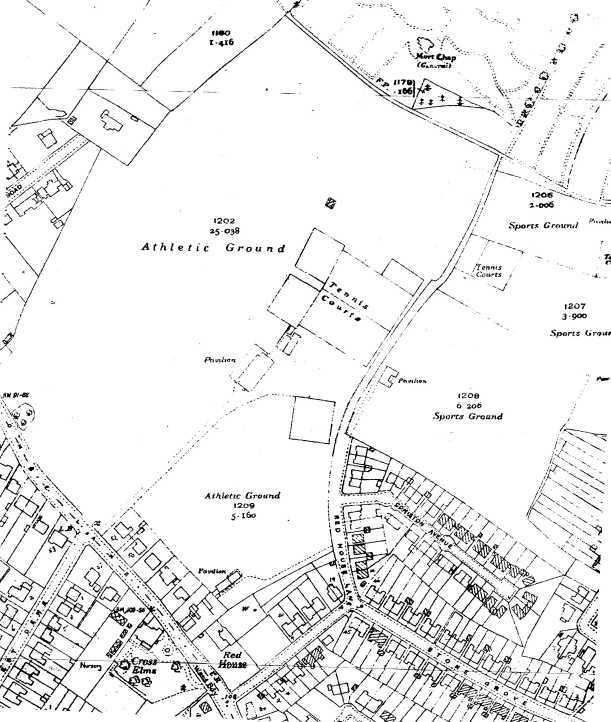 Some time after 1949 the tongue of land associated with the SE corner of field 1208 was sold off for housing fronting Abbey Road. In the 1980's the University sold off a strip of land for housing on the left of the present main entrance. Part of the deal with the developer was the construction of an all-weather floodlight games pitch. In 1999 came the completion of major refurbishment and development of the site with the help of National Lottery and other money. A second all-weather pitch was built, the original resurfaced, new storage facilities supplied for the ground maintenance staff, a grass athletic training track laid out and indoor tennis courts built. Both pavilions were renovated. A cellular phone relay station was also built at the north end of the site, next to the new all-weather pitch, thereby bringing in revenue. Other sources of revenue included rents for pitches and tennis courts. The advent of the indoor facility, open to the public, was another source. Some famous teams have also graced the fields - for instance the Pakistan and Kenyan teams both trained there during the 1999 Cricket World Cup; the New Zealand All Blacks rugby team used the facilities occasionally over the years and various premiership soccer clubs have come prior to FA Cup matches in Bristol. Some of the University rugby players went on to achieve international status, including Jonathan Webb and Keiran Bracken. In spite of all these changes, signs of the old farm and buildings could still be detected in the 1990s. 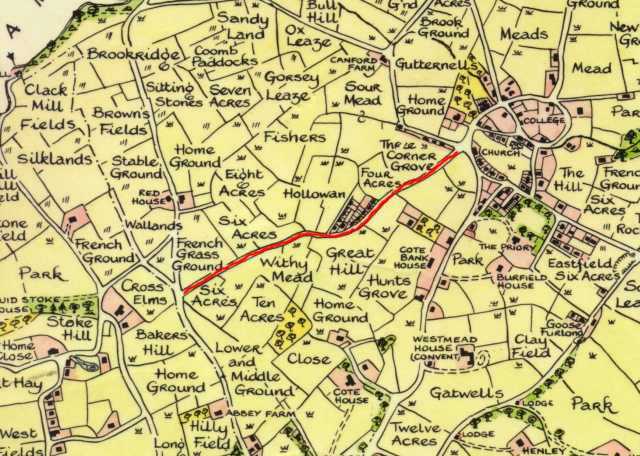 Present on the 1882 OS map is path running north from near field 296. This path ran to the farm's milk parlour, situated about 50m north of the main pavilion. The path was made of stone and much is still present beneath the soil of field 1209. In dry weather the outlines of 2 buildings can be seen on the grass where the path ends, the remains of the milk parlour! Special thanks to both Peter Hudson, Grounds Manager of the sports' complex at Coombe Lane, and Ted Curry, Groundsman and then Head Groundsman 1965-1985, for their help with many details. Ted died in March 2002. James Briggs. Consultant Pathologist, Retired, Frenchay Hospital. Derek Allen. Accountant, Retired, University of Bristol. Occupants. The 1841 Census did not record some of the detail seen in later surveys. The census figures show that, apart from the 1840s, the Red House was not occupied by the owner - perhaps the property was seen as an investment? Some fascinating insights into the costs and the way the Grounds were managed can be found in the DM 1832 reference mentioned earlier. These documents run from 1927 to 1947 and are basically details of day-to-day events. The sports complex had an income, derived from grants from the University, from the Guild of Undergraduates, from winter sheep grazing rents and from rents for various sporting uses, eg the Bohemian Cricket Club paid £125 per season for the use of three pitches. Outgoings in the year from August 1927 to July 1928 showed Rent & Rates of £121/12/- (£121.60), Wages £390/11/- (£390.55), Gas £2/19/7 (£2.98). The overall total was £948/13/- (£948.65) The wage rates included one person at £1/18/- (£1.90) per week and another at £1/-/- (£1.00). In 1929 two tennis hard courts were laid out at a cost of £110/12/3 (£110.61). The Head Groundsman, Mr Bessant, was on £3/5/- (£3.25) per week, his Assistant £2/2/- (£2.10) and two Groundsmen £1/5/- (£1.25) each per week. During the War, in March 1941, Mr Bessant was asking for "a little more petrol for rolling in preparation for the Spring Term". Later he was writing to the University to enquire what was to be proposed to deal with the situation now that his Assistant Groundsman had been called up into military service a day or two earlier. In September 1942 he wrote to the University asking what was to be done with the old cars that had been parked in the grounds as "protection against air landing". He requested that they now be removed as if they stayed any longer "there won't be very much of them left" and all the tyres were perished. Bert Atwell eventually moved them all to one spot with the aid of his horse and cart. They were later taken off the site. Originally they were put there to prevent glider landings. In 1945 the University gave Mr Bessant a rise up to £260 per annum (=£5.00 per week) plus a bonus of £20 for his efforts during the difficult war times. Among many other entries in the archive was a bill in 1946 for the purchase of a new Ransomes 40 inch motor mower and roller for £420 plus £61/8/6 (£61.42) purchase tax. These were very large sums in those days, almost the equivalent of two years wages for Mr Bessant. However, it was still in use in 1999, albeit with a new engine! Annual costs of the Ground were £1405/5/- (£1405.25).